Racing tips: A House party at Ascot? Raheen House can mark himself as a potential leading player in the staying division this term with victory at Ascot. The four-year-old steps up to two miles for the first time in the Longines Sagaro Stakes, but having won over 14 furlongs last term, it would not take much more to bridge that gap. Abel Handy rounded off last year with Group Three glory and can pick up where he left off in the Merriebelle Stable Pavilion Stakes. He meets with old adversary Sound And Silence again and with the scores at one all, Abel Handy can take the advantage. Hors De Combat should be fit for the Celebrating The Commonwealth Paradise Stakes after a couple of decent runs in Dubai at the start of the year. He bagged a nice payday for Denis Coakley when winning a mile handicap in February, ending a long losing run in the process. It is interesting Aidan O’Brien goes to the trouble of sending The Irish Rover for the Sodexo Conditions Stakes and perhaps the hint should be taken. Trinity Star can make a winning debut for Karen McLintock in the Coral Supporting The Northern Racing College Handicap at Pontefract, while Asoof is one to follow at Wolverhampton. Beaten into third at Newmarket, the second division of the Saddle Up For The #bcbf_18 Fillies’ Novice Stakes is a nice opportunity to get off the mark. Bath: 5.45 High Horse, 6.20 La Fortuna, 6.50 Grandma Tilly, 7.20 De Vegas Kid, 7.50 Titan Goddess, 8.20 Frank Cool. Brighton: 4.25 Princess Keira, 5.00 Tin Hat, 5.35 Groundnut, 6.10 Three C’s, 6.40 Outrath, 7.10 Morning Skye, 7.40 Kafeel, 8.10 Krazy Paving. Dundalk: 5.30 California Yoohoo, 6.00 Empire State, 6.30 Elusive In Paris, 7.00 Bucky Larson, 7.30 Flindt, 8.00 Universal Focus, 8.30 Litecoin, 9.00 A Likely Story. Wolverhampton: 1.50 Napping, 2.25 Sea Youmzain, 3.00 Raashdy, 3.35 Jaalboot, 4.10 Valcartier, 4.45 Dolcissimo, 5.20 Asoof, 5.55 Caribbean Spring. 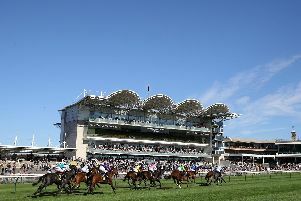 Ascot: 2.00 The Irish Rover, 2.35 Dathanna, 3.10 RAHEEN HOUSE (NAP), 3.45 Abel Handy, 4.20 Hors De Combat, 4.55 Sayem. Pontefract: 2.10 Zip, 2.45 Kings Full, 3.20 Stosur, 3.55 Trinity Star, 4.30 Inner Circle, 5.05 The Right Choice, 5.40 Foxtrot Knight.